In the Kresge Auditorium at MIT, a sizable crowd was on hand for a world premiere of a new work Saturday. Clarinetist (and Kenan Sahin Distinguished Professor of Music) Evan Ziporyn appeared with the MIT Wind Ensemble and gave an exhilarating first performance of Don Byron’s Concerto for Clarinet and Wind Ensemble. Byron is a musical polymath. 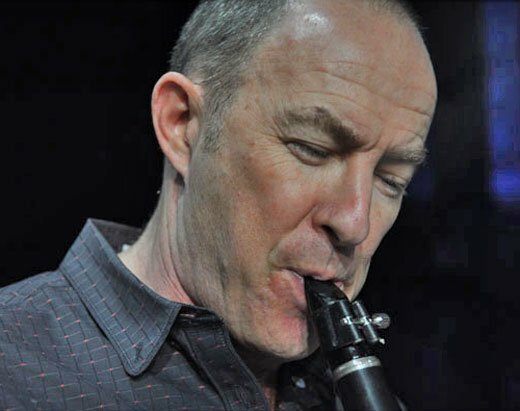 It is easiest to describe him as a “jazz clarinetist”, but that rubric hides the astonishing variety of his talents. He is genre-omnivorous and has been from the very start of his career. His first recording, Tuskegee Experiments, is a fairly raucous and free set of jazz compositions, which is capped by an achingly impassioned performance on bass clarinet of Schumann’s “Auf einer Burg” from Liederkreis. This was followed by a disc that celebrated a klezmer musician— not the Dionysian enigma Naftule Brandwein or the more respectable Dave Tarras, but the antic Mickey Katz. His most recent jazz explorations are driven by his interest in black gospel culture. He has his classical chops, too—he studied at the New England Conservatory in the Third Stream department, and in recent years his composed music has been gaining attention. In 2006, Cantaloupe Records, the house label of New York’s Bang on a Can collective, has released a CD of his works entitled “A Ballad for Many,” with compositions inspired by Ernie Kovacs, Jean-Michelle Basquiat, and the Tuskegee Airmen. The Clarinet Concerto is composed in three movements: Tarantella, Ballade, and Fast Stuff. All three are made out of melodic fragments and harmonic progressions that are derived from popular or jazz traditions, but which are pressed into service creating music with a distinctive voice that transcends any single genre. Byron’s compositional methods have a family resemblance to many of the other Bang on a Can crowd, like David Lang, Michael Gordon, and Ziporyn himself. Rhythm is in the foreground and the development within a piece often relies on varied repetition or juxtaposition of motifs. The technique is more reminiscent of Sibelius than Beethoven, without sounding a bit like either. The melodic and harmonic language is often derived from popular music in its broadest sense— sometimes jazz or rock, but also from popular idioms in other cultures. But the use of popular music is neither merely a borrowing, nor is it just a “cleaning up” of the music for a concert hall crowd. Neither is it postmodern— it transcends pastiche and is dead serious. Instead, in its composed form Byron’s music often intensifies its materials, creating moments of drama and concentrated emotion beyond those permitted by the genre constraints of the source. It is as if he sees the concert hall not as a restraining environment into which other musics must be introduced; instead, it is a realm of expressive freedom. The Concerto is relatively brief—I neglected to time it, but I doubt it lasted longer than twenty minutes—but packs a great deal of incident in that time. In the first movement, the solo clarinet repeatedly states a rapid sixteenth-note melody which the ensemble surrounds with an obsessive tarantella rhythm. As the movement progresses there are echos and cries in response to the solo line. At moments the clarinet suddenly leaves off and begins playing flights of frighteningly rapid ascending notes. The music reaches a peak of expression, when the clarinet breaks off into a quick cadenza, and then the movement suddenly ends. The middle movement, “Ballade”, might seem to promise a respite— and it does so at first, as it opens with rich cushions of ensemble clarinets under which we hear understated melody from the soloist. However, as the movement grows it becomes denser and more urgent, with episodes where the drum set erupts into the texture. The harmonies get denser and splashier—they reminded me 1960’s large big band arrangements (Byron told me later he was thinking “Hawaii Five-O”) and it ends with a loud climax. “Fast Stuff” is built on a very rapid motive that sounded like an homage to the Balinese music which Ziporyn has been exploring for many years; around this grew an accompaniment that Byron says was inspired by Lalo Schifrin. It is all quite brilliant and restless and compulsively listenable. The solo part is quite virtuosic. Byron says he pitched the technical demands at the level of the Nielsen and Corigliano concertos—its constant swirling of notes does call to mind the latter concerto, though with far different expressive intentions. Byron is unafraid to demand that the instrument inhabit its very highest registers, notes that even well-trained amateurs might not have known existed. There was one particularly effective moment that required the soloist to jump back and forth in eighth-notes between those extremes of high and low. Ziporyn handled the part with grace, but also with drama. He made much of the varying textures of the piece, both the great swathes of rapid slurred notes and the outbursts the staccato notes—there was even a bit of “slap-tongue”, a percussive attack that sounds a bit like a string snapping against a fingerboard. He has a distinctive personal tone, rich and woody but with an invigorating edge, a welcome change from the monotonous smoothness of some orchestral playing. After shaking out some initial nerves and imbalance in the first minutes, the Wind Ensemble played with rhythmic verve and precision. Conductor Frederick Harris directed with enthusiasm, and the second movement was especially gratifying as the players leaned into those rich big-band sonorities. The concerto was the final piece on the program. It was immediately preceded by Byron’s arrangement of the Presto from Bach’s first Violin Sonata in G minor for clarinet ensemble. “Arrangement” is not quite the right word; while the piece proceeded from start to finish on the same melodic plan as Bach’s piece for solo violin, Byron uses the resources of an ensemble of twelve clarinets to provide harmonic and melodic commentary is by turns lush and astringent. I believe the sound of massed clarinets is simply wonderful to hear—the richness of harmonics is similar to that of a saxophone ensemble (think Glenn Miller), but with a greater softness and sensuousness. At one point the ensemble plays in octave unison for a few beats and then as the harmony changes it suddenly effloresces into a Gil Evans-like forest of harmony, a heart-catching twist. Like millions of others in America, I came to love music through wind instruments and bands. My respectable western New York high school had only a rudimentary string group; many more of us played on wind instruments which were cheaper and, frankly, easier to start playing, if still just as difficult to master. This is not the place for a long discussion about why we don’t have a popular and thriving wind ensemble tradition in this country, but certainly the lack of a rich and inviting repertoire is part of it. Byron’s Concerto is a piece I expect will have a long life beyond this performance. The remainder of the program was a collection of “standard repertoire” pieces for wind ensemble—the curiously four square Overture for Winds by Mendelssohn, an early Fugue in C and the Variations on “America” by Ives, and Four Scottish Dances by Malcolm Arnold. There was also a traditional arrangement of Bach’s Fugue in G minor, BWV 578, played with enthusiasm by the MIT Wind Ensemble Saxophone Quartet which provided an excellent preparation for the flight of fancy that was Byron’s Bach. It also let us hear long lines of Bach played by the baritone sax, a favorite sound of mine. There was an un-programmed surprise as well: “Rock-a-bye Baby” played by the Ensemble for Dr. Harris, whose wife is apparently quite pregnant and quite due. There was something a little tentative about the Ives and Arnold—they both have moments of humor that fell flat, and the Arnold went at a breathless pace. But the focus of the evening was on the work of Byron, and there the evening was a thorough-going success.